Recently, I was interviewed live on various TV and radio news channels and afterward, I received over 300 comments and messages on social media and in person praising my speech. The word "eloquent" was used over 100 times. Being the daughter of immigrants, I couldn't help but take a moment to think about my linguistic journey and the word so often used to describe me. My father migrated from Pakistan to England in the 1960s as an industrial labourer and worked tirelessly to give his children the education he had to sacrifice. My parents' story is similar to the many other immigrants whose paths of resettlement and integration are riddled with difficulties: one of which is accent prejudice. Growing up in England, I have seen my father, who otherwise came across as a man of great stature and nobility, often stripped of his cloak of respectability the moment he started speaking English. His accent is a strange mix of Pakistani and London English with a touch of Northern Manchester in there somewhere. I distinctly recall conflicting feelings of anger and embarrassment anytime I saw him being spoken down to. He, on the other hand, usually seemed oblivious to the prejudice. In fact, his accent never dissuaded him from speaking his mind. He would persistently work his way up the chain of command at a retail store or school or government office, in person or on the phone, demanding to speak to higher ups until his issue was addressed and resolved, sometimes losing his temper and creating a scene. I resented this when I was younger. But maybe his frustration stemmed from not being able to get his point across or be heard by others just because he spoke differently. My mother was well educated in Urdu and Pashto. Her heart-rending poetry, which ranged from spiritual to philosophical reflections on her life, her relationships and her battle with cancer, is a testament to her eloquence. In Urdu and Pashto, my mother always spoke with confidence and conviction and people always listened to her in awe. But these experiences of admiration and respect did not translate into her interactions in the English language. The same woman who articulated herself so well in Urdu or Pashto often stumbled in her speech as she struggled to find the right words in English. For that, she sometimes faced disparagement and mockery. My parents were frequently met with irritation and disregard. People either slowed down their speech – as if my parents were incapable of understanding them – or started to talk very loudly – as though they were hard of hearing – or simply sighed and tutted out of sheer frustration. It wasn't easy to watch them being disrespected, and I started to call people out. I was 12 when I interrupted a conversation between my mother and her teacher in the cosmetology school she attended. I had to interject after listening to my mother, in her usual respectful, almost apologetic manner, trying to explain something to her belligerent teacher. "Maybe if you explained the concepts properly she will be able to answer the question," I said. The teacher was taken aback and her tone changed instantly. In that moment, I noticed that I was given more respect than my mother. It would be one of many instances which taught me that those who speak English "properly" are more worthy. I couldn't tell if my mother was aware of the blatant linguistic discrimination she faced. She spent years going to ESL classes and insisted we speak to her in English for practise. I also wondered if either of my parents understood the power and esteem so naturally granted to those who spoke English well, and without an accent. And if they realized the lack of authority and respect they received in interactions outside of their diasporic circles. It became clear to me at an early age that I had to speak "properly" if I was to be heard. I have worked hard my entire life not to be seen as the "angry and inarticulate" or the "mumbling and nervous" immigrant. It has been exhausting trying to always be perfect in my speech and how I present myself, to overcompensate in my second language, one in which I have always felt an outsider. My story is not that different from the stories of many immigrants and their children. 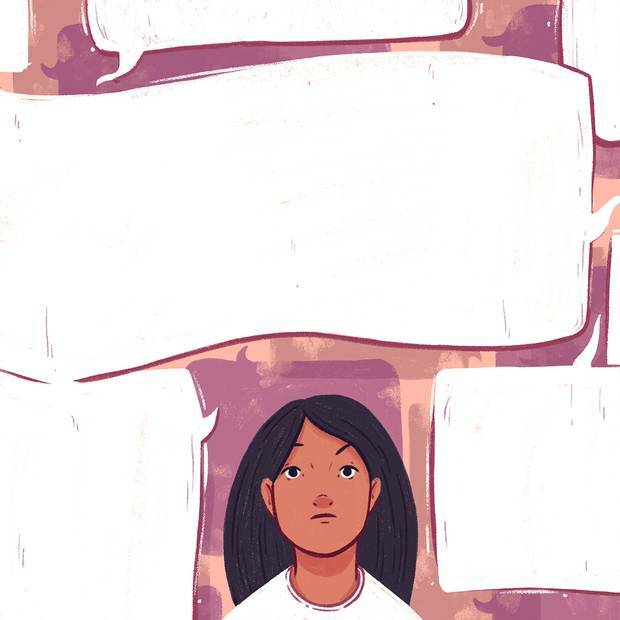 Linguistic discrimination faced by first-generation immigrants puts them at a disadvantage in accessing resources and opportunities so easily available to others, and the pressures faced by their children – as de-facto translators – place an added burden on them, too. Also, differing levels of language fluency create an unhealthy parent-child power imbalance. My linguistic journey has been undoubtedly informed by the struggles, prejudices and biases faced by my immigrant parents and the pressures placed on me to be more "English" and less "other." Discrimination comes in all forms, sometimes overt, other times so familiar yet so latent that the effects of it aren't realized until much later in life. I feel honoured to be known for the eloquence of my speech but it has an important story to tell. Sabreena Ghaffar-Siddiqui lives in Mississuga, Ont.